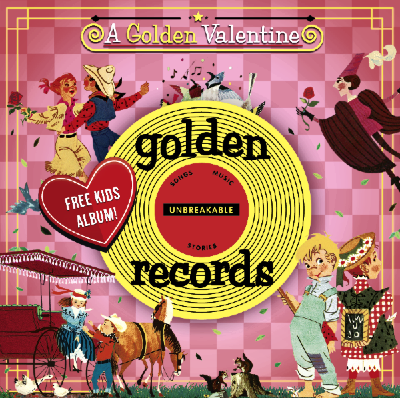 @GoldenRecords Presents: A Golden Valentine - Free Children Valentine's Day Music! Ever notice how there's not a lot of options for kids music on Valentine's Day? Well, we're happy to announce that as of today Golden Records offers a free sampler download exclusively for our little ones! "A Golden Valentine" is a collection of 10 handpicked songs for children, including three bonus celebrity performances from Busy Philipps (Cougartown), Cheryl Hines (Suburgatory) and Didi Conn (Grease). How great is that?! The Golden Records collection recaptures the nostalgic music of yesteryear, creating a collection of beloved instant classics for families to enjoy together. Welcome to the magic of Golden Records! To get your free sampler, before it's too late, for your little one to enjoy feel free to visit Golden Records website or Facebook page!